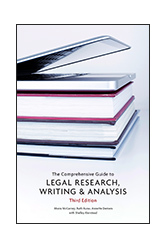 The third edition of The Comprehensive Guide to Legal Research, Writing & Analysis focuses on helping readers develop the competencies required by the Federation of Law Societies of Canada. This is achieved through in-depth coverage of provincial, territorial, and federal research tools and processes. In addition to developing these important communication and research skills, readers will also be equipped to apply them in both academic and professional environments. This text provides a thorough background of the foundations of the Canadian legal system so that readers fully understand the laws and issues that may impact their work. Using this fundamental knowledge, readers will build key skills related to analyzing issues and facts, researching legal statutes and cases from various levels of court, creating and maintaining research plans, developing legal arguments, and transitioning their legal writing skills from classroom to courtroom. These skills can be further refined by using the in-text sample problems created by the accomplished author team. Skills in research, writing, and analysis are essential to anyone aspiring to work in or currently working in the legal field. From start to finish, this resource’s detailed and practical approach supports readers in developing these necessary competencies. 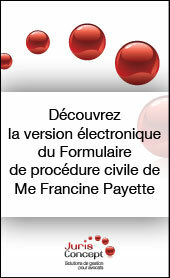 113 internautes ont consulté cette page.